Our Vision: Change the world of social interaction through traditional and non-traditional means, enabling communities to pursue fit and healthy lives. Our Mission: Create opportunities for social interactions that strengthen communities and provide economic impact. America’s earliest communities were built around sports, when our ancestors recreated a sense of “home” by rallying around a game and familiar set of rules. Just like the communities of our grandparents, our company started as a small team of players, when just 16 of us met up in 2010 on top of Baltimore’s Federal Hill Park. Bocce volo was our first ever league sport, a form of overhand or “fly” bocce that we’d play on grass fields. Our mission was humble and steadfast: create opportunities for social interactions that strengthen communities and provide economic impact. cities (and counting! ), from grassy San Francisco parks to Denver’s snow-capped terrain to the concrete lots of Manhattan. Since day one, our belief has held strong that in order to be well we must be social in the world, interacting with people whose backgrounds are different from our own. Instead of being isolated by technology, we wanted to use it to bring people together and build community around a common love for sport. We set out to put this belief into action when we launched our first youth league at Herring Run Rec Center in Baltimore. It was an attempt to expand what we were already doing for our adult leagues as a profitable arm for kids, but we quickly realized that in order to create an environment of inclusion for everyone, we had to remove a major economic barrier. So, we decided kids could show up and play for free—no matter where they’re from, no matter what their skill level or prior sports experience was, no matter how many kids showed up. Everyone could play. This “happy accident” turned into our passion project that is now a 501(c)3 non-profit organization, providing leagues in each of our cities for kids ages 6-12 years of all genders, abilities, and races to play at zero cost to their families. We also partner with local organizations to provide free meals for our young players after the game because free leagues + free food = happy kids. Supported by volunteers, donations, and sponsorships, our foundation has enabled over 800 Baltimore kids to play with us for free in 2016 alone. And we’re just getting started. As we expanded, each city league was given its own name and brand, not just because we wanted to preserve the unique culture of our communities, but also because we had no idea know how big this would become. 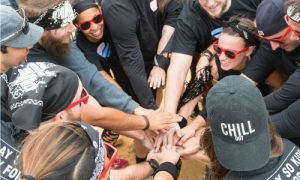 But we’re not just a collection of disparate cities as our brands suggest—we are one united family, connected through volunteering, playing, coaching, and watching social sports. No matter where you go or where you’re from, you have a familiar community waiting for you to belong. Today, we tie our cities together under one unified brand. What does Volo City Mean? Our namesake is inspired by the same style of bocce ball that kickstarted our leagues. Derived from the Italian word “to fly,” volo represents our mission to uplift our communities, boost relationships, and heighten the culture of our cities. Volo City represents more than a game, we are a movement—for people and by people who want to connect more meaningfully with each other. We are a grassroots uprising, helping people actually see who they’re connecting with, and share experiences over the length of a season. In other words, we make our cities fly. Passion: We relentlessly pursue our mission with energy, passion, and determined mindset both at home and in the office. Innovation: We find ways to create uniqueness, solve problems, and change the world of social interaction through traditional and non-traditional means. Volo City will be expanding to even more cities over the coming months, evolving the brand to include fitness and wellness classes, nutrition programs, and highly competitive performance leagues to our offerings. Our goal is to increase the number of people who come together to compete, volunteer, and get social each week. With new Volo City Foundation leagues launching in each city, we’ll also continue to grow the number of kids who play. We’ll also be rolling out technology enhancements to the current experience to make it easier than ever to join the Volo City family. In the end, our brand belongs to those who make it real—the people in our diverse communities who play in Volo City leagues or donate their time and resources to the Volo City Kids Foundation. Despite the thousands of miles that separate us, we are all united by the drive and desire to connect through community and sport. With the power of our new brand, we will continue to grow our family, using technology and sport to unite communities and build real human connection.